Sometimes, when you want a thing to happen so much, you happily overlook minor details such as, say, stark reality. Thus it was that we looked in hope to our quarter-final showdown with Argentina last Sunday despite being without Paul O’ Connell, Peter O’ Mahony, Jonathan Sexton, Sean O’ Brien and Jared Payne. Our captain, future captain, most important player, best ball carrier and most important defender respectively. Was it always a bridge too far? An unrealistic dream fuelled by frenzied support both at home and in Cardiff? If you believe in it enough, then maybe it might just happen. Well not this time and not as far as a hugely impressive Argentinian side were concerned. 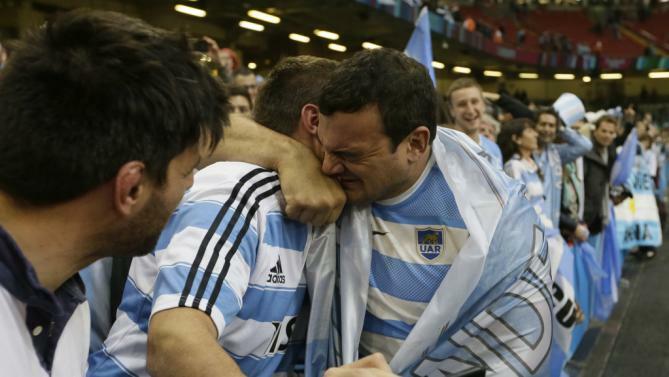 Argentina’s captain Agustin Creevy celebrates with a fan after last weekend’s thrilling victory over Ireland in the Rugby World Cup quarter-final at a packed Millennium Stadium. It seems that a root and branch investigation is set to take place into the state of northern hemisphere rugby. However, once the hyperbole dies down, the realisation will dawn that Scotland were cruelly robbed, while Ireland and Wales were pick-pocketed by that cruelest of foes, misfortune. England and France were admittedly awful but that’s not really something we’re going to lose any sleep over. Were Australia or New Zealand to lose five or in the case of Wales ten players, you can be certain that even they would struggle. Indeed, Australia did not look near as composed against Scotland without David Pocock and Israel Folau, their marquee forward and back respectively. This is not to whinge, simply to lay out the facts as they present themselves. In any event, we find the overreaction to be misguided, though unsurprising. Southern hemisphere sides have won six out of the seven Rugby World Cups played since the tournament’s inception in 1987. Soon, of course, to be seven out of eight. Why suddenly are the death knells of northern hemisphere rugby tolling? Why are we getting so hung up about something we’ve known for a long time? Rugby south of the equator is superior to European rugby. There, we said it. If this wasn’t the case, then why would so many perceived journeyman players travel from the south to Europe at the tail end of their career and have such a decisive impact? Incidentally, the case is identical in rugby league. That is not a reason however to get down on ourselves or incidentally to lump Ireland, Scotland, Wales and to a lesser extent Italy into the same category as England and France. Taking all circumstances into account, the latter have far more deep-lying issues than the other four sides. A couple of thoughts have nagged at us since Sunday. Would Ireland have been less disappointed had they gone down to Australia, New Zealand or South Africa? And was it largely the case that we have, for almost two years, being fixated with avoiding the New Zealand quarter-final? Our prediction of last week’s outcome was laughably off the mark but we were mindful of the fact that Argentina were coming into a game against a team who they have oft beaten in the past surrounded by little or no fanfare. This a side who had shown marked improvement against New Zealand earlier this summer while also beating South Africa in Durban in August. Then, when they pushed New Zealand to the limit in their World Cup opener it was because the All Blacks were sloppy and under-prepared. Two of their famous traits. It has been lamented all week that we have no hope until all our eight-year-old are taught how to offload and learn to value and utilise space as much as the ball itself. Which is all very well but then how does one explain the manner in which Argentinian coach, Daniel Hourcade –admittedly with a major dime from World Cup winning Kiwi coach, Graham Henry- successfully taught a group of men in their twenties, and beyond, to run straight, move the ball quickly and play with width? Jesus, that’s fish and loaves stuff! And this in a country where unimaginative, formulaic rugby formed the cornerstone to their success in recent years. 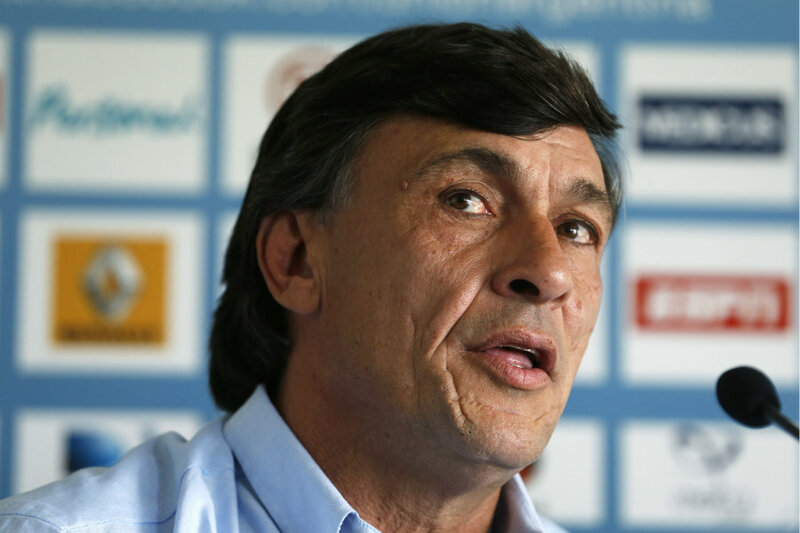 Coach Daniel Hourcade has overseen a remarkable transformation in the Argentinian style of play. Rather than completely tear the template up, Hourcade decided to retain the Argentinian strengths –mauling, kicking-game, strong breakdown work- and supplement his players’ skill-sets with superior handling and ball movement and use of the field’s entire dimensions. The early signs were not promising and Los Pumas shipped some serious pummellings but the fruits of their labour were borne emphatically last Sunday. In this vein, Ireland should retain their focus on those areas where they are strong, and these are not dissimilar to the Argentinians’ strengths, and look to expand their game accordingly. The transition, as with any change in tack, will be difficult but once progress is visible the patience and perseverance will be validated. The idea repeatedly espoused this week that our youngsters should be taught the game differently absolutely carries merit. The oft-cited system in New Zealand whereby children play matches based on weight rather than age is a fantastic proposal. And encouraging a youngster to think their way around rather over an opponent can only be beneficial. Yet the reality is that none of the eight-year-olds in Ballymena, Buccaneers or Bruff are going to be taking the field in Japan 2019 or (hopefully) Ireland 2023, so, while the long-term, ball-centric plan is perfectly logical, it should not prevent Ireland from regarding themselves as contenders for the upcoming tournaments. We’re sure Eddie O’ Sullivan has a suitable mish-mash of clichés about babies and bath water to sum up what we’re trying to say. New Zealand are the standard bearers of world rugby or as Bret the Hitman Hart –GOAT- put it, they are, “the best there is, the best there was and the best there ever will be!” (Even after the Montreal Screwjob!) That does not mean however that we need to base our blueprint on the All Blacks. The bigger picture ideals are fine are and should be legitimately considered but those culture shifting, long-term changes aren’t much use to Joe Schmidt or whoever coaches the Irish rugby team over the next twelve years. In reality, where we exist most of the time, Ireland simply need to retain the foundations and continue building with perhaps a little more adventure. We have been halted, not destroyed, and there would be no sense in razing the city and starting from scratch. This notion that our most capable professional rugby players cannot learn to improve their ball handling and distribution skills under the correct tutelage is completely non-sensical. For the majority of the last two weekends Cardiff was imbued with the energy of thousands of exuberant, carefree and expectant Irish fans. Then came the decimation by Argentina. It’s natural to hit the panic button especially after such a crushing defeat yet less than a week later the mood is lifting ever so slightly. By no means are we underestimating the effort and ingenuity that will be required in the next four years. Nor do we disagree with the mooted long-term proposals as to how the game of rugby is taught on this island. Nonetheless pragmatism must be the order of the day and it is possible to change our playing style without abandoning everything that has gone before. New Zealand are the standard bearers of world rugby. However, in defeat last weekend, Ireland may have found the bar to which they should realistically aspire in the short-term.